Or, why does that ugly loco have an extra tender at the front? A 'Garratt' is a type of articulated locomotive, named after their inventor, designed to solve a problem of traction on railways with tight curves. They are easily recognisable by the additional tender at the front. The basic principle of a Garratt loco is that, at each end of the loco is a chassis holding a set of cylinders and driving wheels. These two chassis are connected by pivots to a cradle that holds the boiler. By making the locomotive pivot, it can go round sharper corners than a fixed-frame loco of the same size. 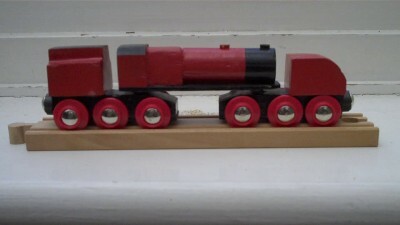 A friend of mine made a model Garratt for his son's wooden railway. The model allows me to very clearly explain how a Garratt works, because it's very simple, and the curves and gradients on the wooden railway are exaggerated, making the articulation much clearer than in real life. If we look at the loco from the side, we can see that it's a bit schizophrenic! Looking at the top half, it seems to be a normal loco with an extra tender at the front, but loooking at the bottom half, the wheels are in the wrong place for it to be a normal loco: it looks like 2 locos, in fact. Actually, that's exactly what it is. The 2 sets of driving wheels are, effectively, two locos, arranged back-to back so the cylinders at the extreme ends of the loco. One of the aims of this loco design is that the weight from the rear tender bears down on one set of driving wheels, which improves traction, whereas on a normal locomotive, the tender is an extra load that has to be pulled. To balance the weight on the Garratt, an extra tender, just for water, is located over the front set of wheels. 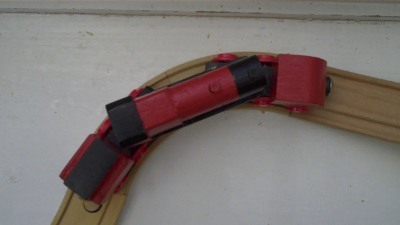 Another advantage is that when negotiating tight corners, the weight of the loco moves towards the inside of the curve, which improves stability, as can be seen in the photo above. This is an advantage compared to other types of articulated loco which have a boiler running the whole length, and which tend to lean outwards on corners. The first Garratt locomotives were designed in around 1907 for railways in Tasmania and the foothills of the Himalayas. On both these railways, the gradients are steep and the curves are tight, and this design of loco proved to work well. 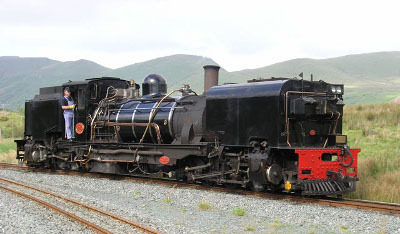 In their heyday, Garratts were extensively used in southern Africa to haul trains across vast distances. There was some limited use of Garratts on the main lines in the U.K. during the days of steam trains, but they didn't really catch on. However they have recently staged something of a comeback thanks to their use on the Welsh Highland Railway (in Snowdonia). These particular locomotives were originally built for a narrow gauge railway in South Africa, and were imported to the U.K. as part of the effort to rebuild the railway which, like the Darjeeling and Himalayan railway, involves sharp curves and steep inclines. For more information about Garratts in general, see Gavin Hamilton's Garratt site. 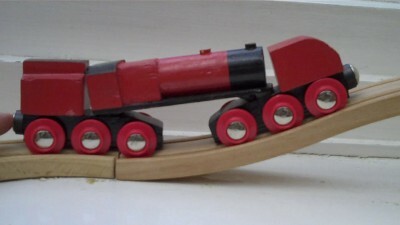 There are a number of live steam Garratts available in 16mm/ft scale. and many others made by other loco makers. Search for "16mm garratt" on Youtube.